Drug discovery isn’t content with target-based screening. It isn’t even satisfied with the recent resurgence in phenotypic screening. No, it is holding out for something else, something even more informative—disease-relevant phenotypic assays. Presentations focused on assays capable of discerning subtle disease-modifying effects. For example, NIH researchers presented a case study in which phenotypic screening was used to identify anti-Zika drug candidates. The Zika virus, we know all too well, is rapidly spreading throughout North and South America, infecting pregnant women and wreaking heartbreaking damage: congenital microcephaly and other severe fetal brain defects. Against Zika there is neither vaccine nor treatment. Given this global health emergency, it is reassuring to hear about Zika-relevant drug discovery. 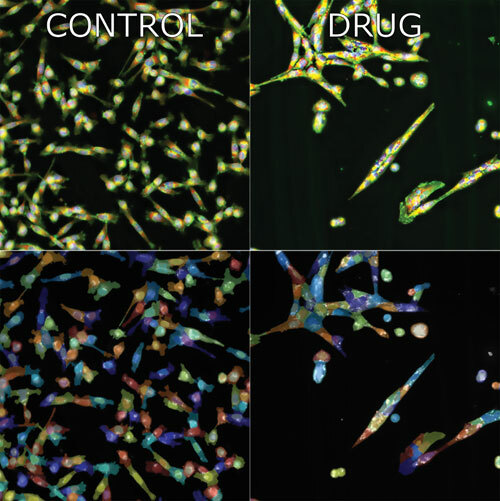 The NIH effort, which was led by Wei Zheng, Ph.D., a group leader at the medical research agency’s division of preclinical innovation, investigated medications that show potential in protecting Zika-infected neural cells against cell death. The NIH effort was, essentially, a repurposing screen. It evaluated drugs that had already passed FDA safety tests. Hence, any effective compounds found with this screen would have been much further along the drug development pathway, and closer to becoming treatments for Zika infection. This approach, screening to evaluate repurposing potential, can “steal a march” on ordinary phenotypic screens. It can save valuable time in finding treatments—an important consideration with emerging infectious diseases such as Zika. “Based on previous reports, we knew that apoptosis and cell cycle arrest were hallmarks of Zika virus infection,” elaborated Dr. Zheng. “Caspase-3 activity was found to be increased in Zika-infected neural cells. Thus, we could use tests for caspase activation and cell viability as phenotypic endpoints for our screen. “Emricasan was found to be effective in protecting neuronal cells from cell death by Zika virus infection through inhibition of caspase-3. There is no inhibition of Zika virus replication offered by emricasan. Currently, emricasan is in Phase II trials for chronic liver diseases. “Another class of drugs, one comprising inhibitors of cyclin-dependent kinases (CDKs), prevented Zika virus replication in neural cells. Because these compounds are all structurally unrelated to one another, we propose that the mechanism of action is through their activity in reducing the activity of CDKs. The literature shows that CDKs are known to inhibit several viruses in culture such as HIV and herpes. Some of these CDK inhibitors are currently in clinical trials for cancer treatments. Another presentation described a technique for measuring the physical movement of cells. This technique was incorporated into a phenotypic assay to determine a cancer tumor’s response to a treatment regime. When a cancer metastasizes, cancer cells move to invade healthy tissues. “We examine physiological qualities of tissue,” explained David Nolte, Ph.D., a professor of physics at Purdue University, and CSO and co-founder of Animated Dynamics. “The process we use to image tissue works on principles similar to three-dimensional and functional optical coherence tomography (OCT). By combining laser ranging with Doppler spectroscopy, we can image up to one millimeter depths inside living tissue, permitting us to see cell movement. The platform was developed by Dr. Nolte in collaboration with John Turek, Ph.D., and Ran An, Ph.D., the other co-founders of Animated Dynamics. The company characterizes the platform as a new form of microscopy. It has already been used to study viability in embryos. Other applications are envisaged. For example, the platform could be used to help oncologists determine whether a cancer is sensitive or resistant to a specific treatment. In this application, living tissue from a tumor biopsy or resected tumor could be diced up into a multiwell plate. Then a screen with two to three different drugs or combinations thereof could provide information on which compounds are capable of influencing cell movement. That is, the platform could relate cell migration to metastasis. This information could help clinicians decide which course of treatment should be followed. “Over the years, Dr. Turek and I have categorized imaging signals associated with specific effects, such as cell cycle inhibition or an antimitotic signature,” noted Dr. Nolte. “Our analysis flags this for clinicians as a potentially good choices for cancer therapies. We only provide this information to oncologist, we do not dictate what therapeutic decisions should be implemented. To address the question of tumor heterogeneity, Dr. Nolte points out that Animated Dynamics does six replicates of every test. This procedure allows the company’s platform to relate tumor heterogenetity to variations in how certain parts of a tumor respond to treatment. Positional information from the tumor is retained during the process of imaging the tumor. In addition to providing unique information to oncologists, the test could also be employed in clinical trials as a biomarker assay to stratify patients. 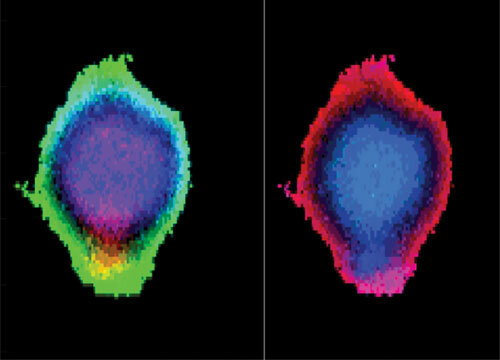 Using new imaging techniques, Animated Dynamics looks at biodynamic markers (those that show physical movements inside the cell) in a human esophageal cancer biopsy. The same sample is shown in the left and right panels, but the biodynamic biomarkers are different. These biomarkers show how the sample responds to the combination cancer drug therapy combination of cisplatin (Cis) and fluoropyrimidine (5-FU). Scale bar: 100 microns. The section is from 300 microns deep in the biopsy. Another new approach to phenotypic screening involves the use of prior knowledge and iteration between phenotypic screening and novel compound design. “Phenotypic screens are typically done with large compound libraries,” says Neil Carragher, Ph.D., professor of drug discovery, Institute of Genetics and Molecular Medicine, University of Edinburgh. “With our approach, we begin with a known target or ligand to identify high-quality chemical starting points. From there, we used rational drug design to generate 30 to 100 compounds, with some aspect of novelty. “Once the compounds are designed, we do the screen and identify the hits, using a phenotypic endpoint to evaluate compounds. With a smaller library, one can use more assays to precisely guide hit selection and chemical design toward specific phenotypic profiles. All this helps assess efficacy of the compounds. “A successful example of this can be found in a project that started with a compound known to inhibit many kinases. Using a phenotypic screen with four rounds of structure-activity relationship (SAR) iteratively, we found a compound that inhibits SRC but not ABL kinases. This is very advantageous for cancer treatment in that SRC is often overexpressed in breast cancer while ABL can act as a tumor suppressor in a subset of cancers. “We successfully applied this approach with minimal funding over two years to rapidly and cost-effectively identify an active compound that matched our desired phenotypic profile. Further development of this compound lead us to eCF506. This compound exhibits several promising characteristics for drug development including excellent physiochemical properties, oral bioavailability, and a unique target selectivity profile. “A small compound library allows us to test compounds in increasingly more complex assays that are capable of representing patient disease. Additionally, the screen can be carried out across multiple cell types with multiple assays. Whole animal models such a zebrafish are also feasible to use in a screen to monitor more complex physiology and toxicology responses to help triage phenotypic screening hits. At the University of Edinburgh, researchers used a phenotypic screen to find a compound that inhibits SRC but not ABL kinases. The compound led to the development of eCF506, which was withheld from the breast cancer cells shown in the left panel, but added to the breast cancer cells shown in the right panel. Currently available SRC inhibitors also inhibit other kinases, in particular ABL, which might result in lower anticancer activity in some tumor types and adverse side effects. Biological systems are complicated, so models of these systems also need to be complicated. For example, if models of disease-modifying drug activity are to be useful, they must embody some degree of biological intricacy. A model that incorporates but one drug, directed against one target at one point in disease progression, may be too simplistic. It may fail to capture the processes that support or counter multifaceted diseases. Complexity may be captured by quantitative systems pharmacology (QSP), an integrated approach to assessing disease progression and elucidating the mechanism of action of potential therapeutic compounds. QSP encompasses various computational and experimental methods. Instead of focusing on one gene as the cause of a disease or one approach to a disease, QSP applies a systems approach in the hunt for therapeutic strategies. Optimizing therapeutic strategies for a disease often means using a combination of drugs. “We integrate computational and experimental methods to build a better hypothesis of how a disease occurs,” states Mark Schurdak, Ph.D., director of operations, Drug Discovery Institute, University of Pittsburgh. “By iterating this process—building a hypothesis, experimentally testing the hypothesis, and repeating—we can get to a better understanding of disease progression. “We begin with patient data to keep the research clinically relevant. But the whole QSP platform is highly collaborative and accommodates input from clinicians, computational scientists, experimental biologists, chemists, pharmacologists, and structural biologists. A team approach is critical for the QSP platform. “In Huntington’s disease, the huntingtin protein interacts with many protein partners. This can be described as a pleiotropic protein. We are unsure which interactions are critical for disease progression. “We started with protective compounds in cell culture. Next, we computationally predicted additional compounds that might be neuroprotective. In parallel, we screened compounds with known canonical mechanisms of action, looking for ones that are neuroprotective in an in vitro model. “We identified several compounds that are partially neuroprotective. A number of the compounds give only 50% protection. “We attributed deficiencies in protection to heterogeneity. We postulate that effects that are often attributed to noise in a biological system are actually biological differences. Within a cell population in culture, there may be subpopulations of cells, or cells in different transcriptional states. This explains why one cell is sensitive to one compound or mechanism, while another cell responds to a different drug. “Next we asked the question of what would happen if we combine these compounds. We found synergistic effects. All the tested compounds with synergistic effects have a canonical mechanism of action. From there, we went back and analyzed how these compounds related to one another and their role in Huntington’s disease. “Finally, we inferred pathways involved in neuroprotection of the cells. This has lead us to the Rho-associated protein kinase (ROCK) pathway, the inhibition of which has been shown to ameliorate the effects of Huntington’s disease. By inhibiting this pathway, survival mechanisms are hypothetically activated. Another strength of phenotype screens is the ability to more closely replicate disease conditions found in patients. Exploiting this strength, Charles River Laboratories completed a study involving the autoimmune disease scleroderma. The company was particularly interested in looking at fibrosis of the skin. “To develop a disease-relevant phenotypic assay, we developed primary cell-based assays of fibroblasts from skin biopsies of patients,” explained Jeroen DeGroot, Ph.D., senior director, biology, Charles River Laboratories. “Next, we screened a library of inhibitory small hairpin RNAs. This permitted us to discover novel pathways involved in fibrosis.” The entire study was done for a client interested in identifying novel therapeutic targets for fibrosis. Charles River is a well-established provider of animal models for research, but it also offers an integrated approach to drug discovery. Accordingly, it can guide pharmaceutical and biotech companies through the early stages of drug discovery. “By looking at a more holistic level, we can determine how the complete cell responds to the intervention, then quickly ramp up to studying the intervention in animal models for disease,” Dr. DeGroot continued. “For complex diseases, such as scleroderma, cells from healthy tissue are not the same as cells from diseased tissue, even after culture and expansion from the primary tissue. Fibroblasts isolated from affected and unaffected skin maintain differences even after the fourth passage. 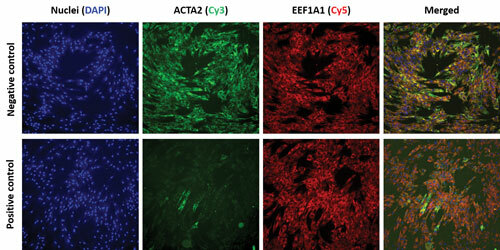 These images, prepared by Charles River Laboratories, depict the high-content screening of human primary fibroblasts from a scleroderma patient: mRNA expression of a-smooth muscle actin, a fibrosis marker, and a housekeeping gene (EEF1A1) were determined using fluorescence in situ hybridization. Nuclei were stained with DAPI. High-content imaging was performed with GE Healthcare’s IN Cell 2200 instrument.